This novel approach helps students understand that diseases are rarely confined to one body system and challenges them to apply what they’ve learned to a range of diseases, rather than trying to memorize facts about specific conditions. In the process, they learn to think about pathophysiology in the same way practioners do in a clinical setting—by working from symptoms to the cause, rather than the other way around. New! Pathology Up Close features provide more detailed coverage of the cellular and tissue changes that accompany disease. New! Clinical Practice features show students how they will apply what they are learning in real-world practice. From the Lab boxes help students understand common laboratory procedures and results. Stop and Consider prompts challenge students to think beyond the information presented in the textbook. Discussion and Application sections in every chapter help students gauge their understanding of what they’ve studied. An integrative case study at the end of the book helps students apply the complex pathophysiologic concepts they’ve learned to a common condition—diabetes mellitus. 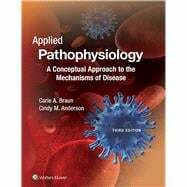 Applied Pathophysiology A Conceptual Approach to the Mechanisms of Disease: 5 out of 5 stars based on 1 user reviews.